This page together with our terms of service and terms of sale of goods details Shot Scope Technologies’ Returns Policy. In the event that you are not satisfied with any purchase from Shot Scope Technologies, you may return the goods, along with original packaging and any labels within 28 days of receiving the product. Faulty products returned after the 28-day period and within the limited warranty period must be returned to us as specified in the Returns Form. Contact Shot Scope Technologies customer services for instructions (e-mail support@shotscope.com). Items purchased at retail or online stories must be returned where you purchased them. Return policies at these outlets may vary. Shipping fees for returns are the customer’s responsibility. Return shipping costs can only be refunded where we have sent the wrong goods in error. We recommend that you use a reputable courier. We cannot accept responsibility for the returned goods until a member of our staff has signed for or acknowledged receipt of the goods. 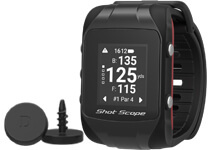 Contact Shot Scope Technologies customer services at support@shotscope.com for shipping details. Please provide your name, home address, details of the order and, where available, your phone number and email address. We will refund you on the credit card or debit card used by you to pay for the Product(s). If you used vouchers to pay for the Product we may refund you in vouchers. All refunds will be made within 14 days from the day on which we receive the Product(s) back from you.